This short protest safety workshop is scheduled for one week from now, in partnership with Reed College’s “Greenboard” student group. Reed College is located at 3203 SE Woodstock Blvd). It is served directly by Trimet Bus lines #19, 10, & 75). In this workshop, we will discuss ways to prepare yourself for the next demonstration, occupation, or whatever else may be on the horizon. We cover everything from warm layers (no cotton!) 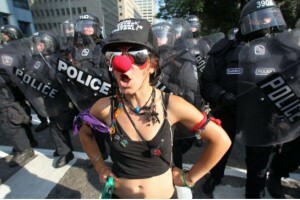 to jail support and the proper treatments for pepperspray. This is our basic protest preparation workshop and not a substitute for a Street Medic Training. It will be part lecture and part practice. All activities are optional.